THE LOVELY AND THE LOST follows Kira, a girl who was once found by search and rescue (SAR) and who is now seeking certification to become a SAR partner with her dog Saskia. Kira does not have many memories from the time before she was found in the woods, but she has worked through her biggest issues from her weeks surviving and enjoys life with her mother, Cady, her brother, Jude, and their neighbor and near-family friend, Free. Kira feels very connected to the dogs they train and the people in the family. 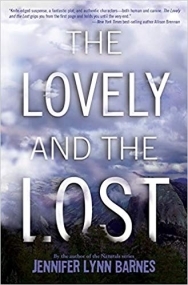 When Cady’s father shows up asking for help to locate a missing girl in a large national forest, the family travels to Sierra Glades with their dogs to try to find the nine-year-old Bella. As they begin to search, Kira begins to have flashbacks to the life she had forgotten. As time passes and the trail is harder to follow, the plot around the family thickens- both with Kira’s past and also with the past that Cady left behind (including who is Jude’s father). At the same time, a boy with his own haunted past, Gabriel, is also holding secrets that will play in to the overall story. What I loved: The pacing in this book was absolutely perfect, driving the reader through chapter to chapter with a lot of mystery/suspense. The flashbacks added some extra intrigue, but many characters are hiding secrets, so the plot is full of things to keep the reader’s interest- not to mention the mystery of what happened to Bella. As the story develops, we explore not only the present but also the past and how it weaves into who the characters have become. The characters themselves are easy to engage with and like. Jude was especially a favorite with his eternal optimism and funny quips. Despite having so many characters, they were all distinct, memorable, and easy to follow. The premise with the SAR was also engaging and provided an interesting backdrop for everything else that was happening. This was truly a page-turner that begs to be read in a single sitting, so I would not recommend starting it at bedtime! What left me wanting more: Pretty much nothing! This is truly a great story, and although pretty much all the major plotlines were wrapped up, there is one that adds an air of the unknown to the ending. As not everything is wrapped up in a bow at the end, I have hopes that this could be a series- and I would be fully on board with that! Final verdict: This is a truly engaging character-driven YA mystery/suspense with a unique story and unputdownable pacing. I highly recommend for people who like complex plots and light thrillers.